SRI LANKAN conglomerate Ceylinco Consolidated plans to expand into Malaysia's property investment and financial services sector, despite a gloomy world economy. The group, which has interests in banking, property, healthcare and insurance, is already buying some properties in Malaysia. "In fact, we already started entering into property in terms of buying shop lots and others. We expect to go into construction by next year," deputy chairman Sanka Wijesinghe said. The company also has Bank Negara Malaysia's approval to operate fast-cash outlets, especially for Sri Lankan immigrants to send cash home. 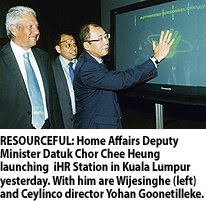 He was speaking to reporters after the launch of iHR Station in Kuala Lumpur yesterday. iHR Station is a Web-based human resources information system. It comes with consultancy and advisory services and is jointly developed and offered by Ceylinco Consolidated, hSenid and iHR Consulting Sdn Bhd. Ceylinco Consolidated first entered Malaysia in the insurance market in Johor Baru in 1989. Since then, the company has turned Cyberjaya into a hub for its global trading and services, said Wijesinghe. The company set up its Malaysian subsidiary in Cyberjaya known as Ceylinco Consolidated (Malaysia) Sdn Bhd in 2000. He said it expects to break even its investment in the iHR Station project within one year. "We have spent a minimum of RM10 million for the development of the iHR Station project. We expect to secure sales of at least RM500,000 by next year," he said. The company has already secured 60 customers since iHR Station was introduced in April this year. "We hope to go regional by 2010," he said. PROPERTY prices will fall by 5-10 per cent from the first quarter of next year as a slower economy cools demand, a property consultant said. The slump in prices will be for properties across the board, Association of Valuers & Property Consultants in Private Practice Malaysia (PEPS) president James Wong Kwong Onn said. He said properties below the RM300,000 radar and luxury condominiums tagged at above RM750,000 are already hit from a slower economy. Wong believes there will be a correction in the housing market next year. "There will be fewer launches due to poor demand. Prices will fall, but gradually, due to lack of confidence in the market," Wong said after a media briefing on the 2nd Malaysian Property Summit 2009 in Kuala Lumpur yesterday. But Wong said a housing bubble is unlikely although the market will be depressed by a slew of bearish factors like poor economic data and worries over increasing credit market losses in the US. He said Malaysia's real estate is resilient enough to withstand the onslaught of the economic turmoil. His confidence is boosted by the RM7 billion economic stimulus package announced last month. Wong expects Malaysia's real estate to also fare better than Singapore, Thailand and Hong Kong as the latter three are more exposed to the US-led subprime crises. "Property prices in these countries have also shot up by 100 per cent or more whereas the upward price in Malaysia was gradual. There is room to grow so we will definitely fare better," he added. Meanwhile, Sime Darby Property Bhd managing director Datuk Tunku Putra Badlishah said the company has new products lined up for next year but will remain cautious when planning the launches. "We are fortunate as most of our landbank is in prime areas and a majority of our market is owner-occupied. Despite the market shrinking, we believe it has eased a little," he said. In the past one month, Sime Darby has been able to sell 241 properties worth RM141 million located within its 10 on-going townships. Sales were boosted by its "Guaranteed Buy Back" scheme, instilling confidence in buyers. The 2nd property summit, organised by PEPS, will be held on January 20 2009 at the Sime Darby Convention Centre, Kuala Lumpur. More than 200 participants from various sectors are expected to attend. KUALA LUMPUR: Malaysia’s property prices will not fall as drastically as the prices of properties in Hong Kong, Singapore and Thailand next year. Association of Valuers and Property Consultants in Private Practice Malaysia (PEPS) president James Wong said during the boom period, property prices in the latter three countries’ had risen tremendously over a short period while Malaysia’s only had a gradual appreciation. “Hong Kong and Singapore’s exposure to the US economy also contributed to a more drastic price downfall during these difficult times,” he told a press conference yesterday on the second Malaysia Property Summit 2009. The one-day summit, organised by PEPS, will be held on Jan 20, 2009, in Kuala Lumpur to discuss on the current issues and outlook of the property market in Malaysia. PEPS expects 250 participations next year against 175 this year. Wong attributed the softening property market to lower consumer confidence level, with many buyers adopting a wait-and-see strategy in view of uncertain economy. The low and medium-cost properties would be affected more than the high-end ones. “For the Grade A and strata title offices in the Golden Triangle, we do not think there is oversupply. The rental rates in this area are between RM7 and RM9 per sq ft,” he said. “In the retail sector there could be an oversupply as there will be additional shopping centres to be completed next year. If the economy continues to deteriorate, the hotel sector will also be affected from fewer foreign travellers,” he said, adding that the domestic property prices would further moderate next year and were likely to recover in three years. Sime Darby Property Bhd managing director Datuk Tunku Putra Badlishah concurred with Wong that domestic prices were not likely to drop drastically as profit margins of developers were already low and Malaysia had only experienced a gradual appreciation previously. He said with the soft property market, it was even more important for developers to produce innovative and quality products.